Jul 15, 2018 by Grace Halden Admin	in New! 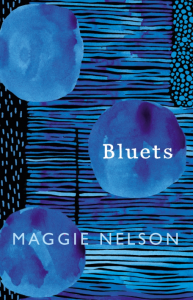 It’s hard to tell you what Bluets by Maggie Neslon is – it’s not a novel, it’s certainly not a short story either, it’s perhaps creative non-fiction, yes, but it doesn’t conform to the usual narrative tropes – event though there are searing passages about loss and love. It’s a book then, yes, but what kind of writing is this? Written as a numbered list and a meditation on the colour blue, it seems to be a series of propositions, but it’s not philosophy, although it comes from a rich knowledge of and conversation with philosophy. It’s a curio then, what we might call belles-lettres – or fine writing – but this is often used as a pejorative and, the book evades that too – there are certainly some lovely passages of poetic prose, but that’s not this only engine that drives this curious and moving book. Each section is numbered – like a list – a shopping list, or a list of memories, or a set of provocations – or perhaps all of these. Perhaps its best if we don’t look too hard for a category definition and accept that this book sits in a new place – we might call it creative and critical writing – a place where both the thinking and knowledge of the critical class and the craft of the creative writing workshop come together. So in the workshop we discuss experiences created by the work. What has affect and what doesn’t. How certain changes to point of view create different perspectives and ways in to the story, how characters are always moving through time but at the same time floating in the space of their consciousness. We experiment – use the workshop to try new voices, and approaches. We problematise the idea of character and wonder about what we might mean about point of view – and who has the power. How by just changing where we are standing in relation to the subject changes what you can see. The writer will present an extract of work in progress developed under the editorial scrutiny of their peers and their course leader. In the critical seminar – especially in the field of the modern and contemporary we are looking at what’s going on around us now – considering ways of thinking about identity, society, and culture. How writing and art is produced and what it might mean. Traditionally, a student will respond to these courses with an essay – a researched and argued piece of scholarship which shows reading and depth of thought. An answer to a question, an investigation. The word essay comes from Middle French – essai – meaning trial, attempt, endeavour but has become in the academy at least, the traditional means of assessing knowledge in the humanities – can the student synthesise their knowledge, show that they understand how to reference and back up their arguments, can they show depth of thinking? But the essay can also be a very rigid form. It takes away the subjective – there are no interventions from ‘I’ in a rigidly defined Academic Essay – it’s not about what you think, or feel, but what you can prove. So there is a kind of neutralising academic language which denudes the essay of its creative logic. It may be easy to look at the underpinning reasons of why we got here, but perhaps, right now, more than ever, we need creative thinkers who can synthesise a whole range of matters and also create affect. Who can create an experience for the reader. So what occurs if we bring these two disciplines together? The one of critical thinking and the other of creating – or trying to – something which affects the reader? Aristotle called the study of rhetoric, the education of the emotions. In this sense Creative Writing practice intervenes in the rigid essay writing and has an interesting effect – the subjective ‘I’ starts to emerge. Writers who study affect by trying to achieve it in their work begin to understand something about the creative transmission of language and the way in which experience is encoded into that. The writer learns something not just about how to write better, but about themselves too – what linguistic tics and prejudices might be evident in even the smallest choice of adjective. So there is a new kind of creative/critical work emerging – a new kind of writing – and Bluets is a good example of this – which I might suggest comes from the fact that authors, far from being dead, have been knocking around in the institutions for decades now. Academics are writing more long form pieces, but pieces which are still absolutely as tightly underpinned by reading and scholarship. Along with Maggie Nelson we can look at the work of Sheila Heiti, Rachel Cusk, Ben Lerner, Andrea Long Chu, Olivia Laing, and so on. There is a new hybridity, and a new need to interrogate discourse. The essay is breaking out of its institutional conventions and becoming another kind of creative prose – the lyric essay, personal essay – whatever you want to call it. And it’s not just the essay – literary fiction is becoming more questioning – in some cases returning to the speculative to deal with the present or working in the micro-statements of flash fiction. The categories of the library and the bookshop are being re-imagined. All these developments and more, are aspects of a new course we are running at Birkbeck in Creative and Critical Writing, in an age where it seems as if everything has become flattened by the internet – we can access everything now – from the history of medieval ships, to the schedule for Netflix, to a wiki on Margaret Atwood, to a report on Brexit – all at once. But what does this mean? How does it affect me that I can access all this knowledge – without its previous temporal categories? It means we need a new way of responding and thinking, of synthesising and expressing what we know. As all course designs are in a way mini- manifestoes or small utopias, what we are hoping for from our new endeavour, is to offer a learning space where the student writer can make many attempts to answer this kind of question. Where they can learn to synthesise knowledge in a new way – one which doesn’t depend on the old structural models, but which can find new ways of posing the necessary questions about what it means to live now. 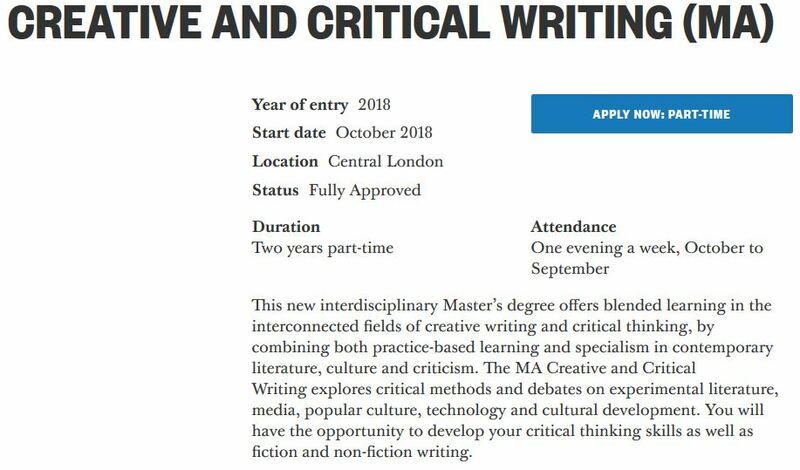 Birkbeck’s new MA Creative and Critical Writing (2018) is now welcoming applications.